The basin and fountain of Latona are seen here from the west looking east toward the Orangerie, Palace of Versailles. 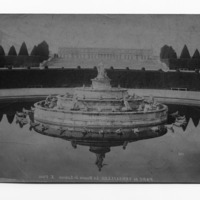 This fountain and its basin were models for Grant Park planner Edward H. Bennett and associated French designers. They produced a larger version of the Versailles originals, but with entirely new sculptures. This view is from among Bennett's collection of study prints, about eight hundred in number. Also, in the lower part of the image are some pencil calculations, perhaps used in scaling up the design for Grant Park. “PARC de VERSAILLES, Le Bassin de Latone,” Digital Collections - Lake Forest College, accessed April 26, 2019, http://collections.lakeforest.edu/items/show/2095.